Product Description: There are two kinds of classic car buffs: those who have restored an old car, and those who want to. For anyone who has looked at a rusty heap in a field and seen only the gleaming new machine it once was, the urge is powerful, but also intimidating. Restoration can be a difficult, expensive, and--especially for the novice--mysterious undertaking. Dave Floyd, an enthusiast with a lifelong love for the great cars on the road in his youth, is one who answered the call. In this book he traces every step of restoring a long-neglected 1948 Chrysler New Yorker to its original glory, all on a real-world budget and in the spare hours left by a full-time job. Every task, every discovery, every obstacle, every triumph and frustration comes through in a detailed account that is part diary, part practical guide, part love story. 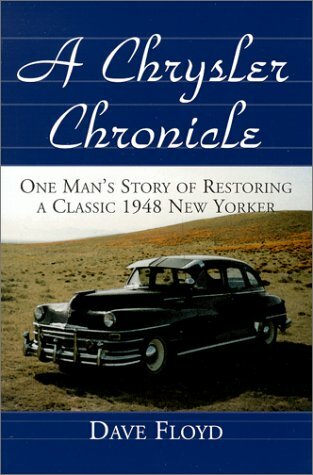 Told with great charm, his story is inspiring to any prospective old-car hobbyist, and a special treat for Chrysler devotees.